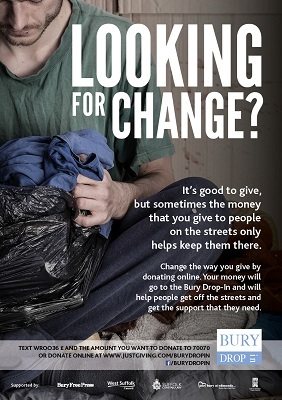 A charity in Bury St Edmunds is asking the public to think about how and why they give to homeless people on the street. 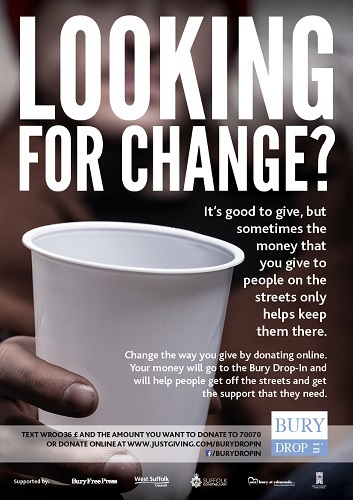 The Bury Drop In Centre has launched an alternative giving campaign called “Looking for Change” which encourages people to help the homeless by text or online donations. A team of volunteers at the Drop In work provides support for vulnerable people in the town. They serve food and a warm drink to people who are rough sleeping as well as working to help rough sleepers get a roof over their head, any support they may need, improved health, education, clean clothes, a job and to reconnect with their families if they want to. David Bonnett, one of the founders of the Bury Drop In said: “People see those less fortunate than themselves and they want to help. The issue, however, is how they help. “Some people will buy them a coffee or a sandwich and that is perfectly fine. Many will give money and sometimes that is then spent on the same substances that then make it more difficult for them to stay in accommodation. We also know that some of the people that we see on the streets aren’t rough sleepers at all, but others taking advantage of the public’s goodwill. The campaign is backed by a number of partners including West Suffolk councils, Our Bury St Edmunds which represents town centre businesses in the town, Suffolk Police and Bury St Edmunds Town Council.